A set consisting of one white Margrethe mixing bowl 3.0 with an anti splash lid. The Margrethe mixing bowl has an anti slip ring to ensure that the bowl stands firmly on the kitchen counter, which makes it ideal for mixing. The anti splash lid is transparent, allowing you to see the contents of the bowl and has an opening big enough to fit a standard size mixer. 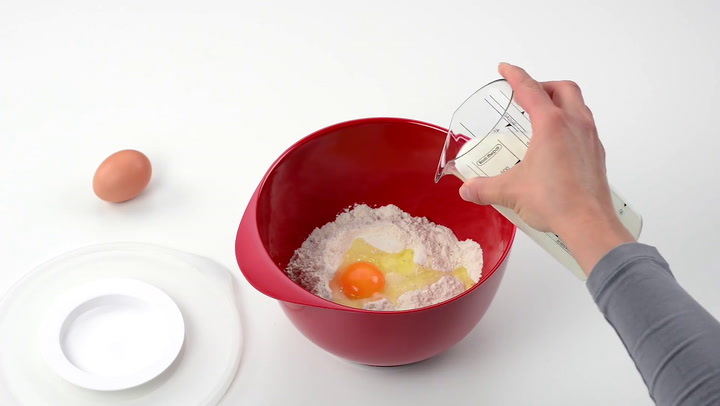 After mixing, the contents of the bowl will remain fresh longer by closing the sealer on the lid. Very Handy! View more from Mixing Bowls, Gifts for The Newlyweds, Rosti.